Who would’ve thought an invisible line would be so hard to find? As the very name of the country describes, the Earth’s Equator bisects Ecuador into the Northern and Southern Hemispheres—although pinpointing the exact location of that line has been an ongoing challenge. For hundreds of years, it was believed the Equator bisected Ecuador at the Mitad del Mundo monument, but new data has revealed the site is off by a few hundred meters. The nearby Intinan Museum, it’s said, is the site of the real Equator, although GPS info seems to point out that neither spot is correct. Either way, regardless of the Equator’s exact location, this small museum north of Quito is still a fascinating stop. Try to balance an egg on a nail or watch water spin opposite ways, and while some of the exhibits might be staged, the concepts behind the gravity and physics are curiously entertaining. In addition to exhibits about the Equator, the Intinan Museum also offers a look at Ecuador’s culture—from the biodiversity of the Galapagos Islands to Amazonian tribes. There’s even the chance to take a photo with an ancient shrunken head, and while the somewhat kitschy Equator tricks are admittedly fun to see, it’s the authentic looks at Ecuadorian culture that defines this Quito museum. The Intinan Museum is open daily from 9:30am-5pm. Admission is $4 for adults, $2 for children, and the museum is approximately a 20 minute cab ride from the center or Old Town of Quito. Escape the city for a full-day adventure in the Ecuadorian Andes on this private tour from Quito. Get your adrenaline pumping as you zipline through the Mindo Cloud Forest, sample coffee and chocolate on a tour of the El Quetzal Chocolate Factory, and walk along the equator line at the Mitad del Mundo. Tour includes lunch, hotel pickup, and all activities. The Equator line and the Pululahua Crater are two of the most visited attractions around Quito. This private half-day tour combines both, with a visit to the Intiñan Equator Museum, followed by a scenic tour of Pululahua. Hotel pickup and drop-off is included. Maximise your time in Quito with a private full-day tour that checks off all of the capital’s most popular attractions. Take in the highlights of the UNESCO-listed historic center; admire landmarks such as Plaza de la Independencia, San Francisco Monastery, and the Panecillo; then walk along the Equator Line at the Intiñan museum. Hotel pickup and drop-off is included. When the French Geodesic Mission surveyed the equator in 1739, they declared the spot of this monument outside Qutio as the Middle of the World. With this full-day tour from Quito, enjoy a day away from the city as you visit the Middle of the World monument, as well as the real Latitude Zero 787 feet away. You’ll have time to visit the Ethnographic Museum and the Inti Nan Museum. Journey to the 'Middle of the World' on this memorable tour that stops at the Pululahua Crater, Intinan Museum, and more. You'll learn about local customs and traditions from a friendly guide and capture panoramic city views of stunning Quito from atop Teleferico. Explore the historic sights of Quito, including its iconic ‘Middle of the World’ monument situated on the equator, during this full-day private tour. Start your day in the Old Town section of Quito, visiting two of its top churches, La Compañía and San Francisco, and checking out the government palace. You’ll then head to the ‘Mitad del Mundo’ (Middle of the World) monument, marking zero degrees of latitude, where you’ll explore the Intiñan museum and a number of on-site attractions dedicated to this unique geographic location. This Quito city excursion also covers round-trip hotel transport, a private guide and vehicle and entrance fees. Maximise your time in Quito with a private full-day tour that checks off three of the capital’s most popular attractions. Take in the highlights of the UNESCO-listed historic center, walk along the Equator Line at the Intiñan museum; then marvel at the views from the Pululahua crater. Tour includes lunch, hotel pickup, and all activities. Enhance your experience of the Middle of the World Monument (La Mitad del Mundo) on a private 3-hour tour from Quito. Alongside a local guide, you’ll visit the Intiñan Museum to learn about the discovery of the equator and then straddle the Northern and Southern Hemispheres at the Middle of the World Monument (La Mitad del Mundo). Private hotel pickup and drop-off in Quito are included. Explore Quito and the wealth of cultural, natural and historical sights in the surrounding region during this 7-day, 6-night excursion. During the course of your trip you’ll check out the historic churches and buildings of Quito, go shopping for handicrafts at indigenous markets and discover volcanoes, hot springs and glaciers hidden among the towering Andes. Among the highlights are the Middle of the World monument near Quito, Cotopaxi National Park and Papallacta Hot Springs. This multi-day adventure near Quito includes a private guide, accommodations, meals, entrance fees and more. Spend the day exploring some of Ecuador's top attractions with this popular tour from Quito. Follow your expert local guide to Nanegalito, where you'll savor the region's unique and bold flavors. Visit the Museum of Tulipe, sip coffee at the Reserve of Bellavista and trek through the lush landscapes, then make a stop at the Middle of the World Museum on the equator. Visit two Ecuadorian attractions in one day on this 9-hour combo tour from Quito. First head to the 'Middle of the World,' or 'Mitad del Mundo' in Spanish, to learn a bit about local culture. Then take a horseback ride through the Pululahua Crater to discover its lush landscape, which makes it one of the only calderas in the world where inhabitants farm. Equipment and lunch are included. Visit two of the world’s most interesting locations on a full-day private tour. First, visit one of only two inhabited volcanic craters in the world and see how locals are living. 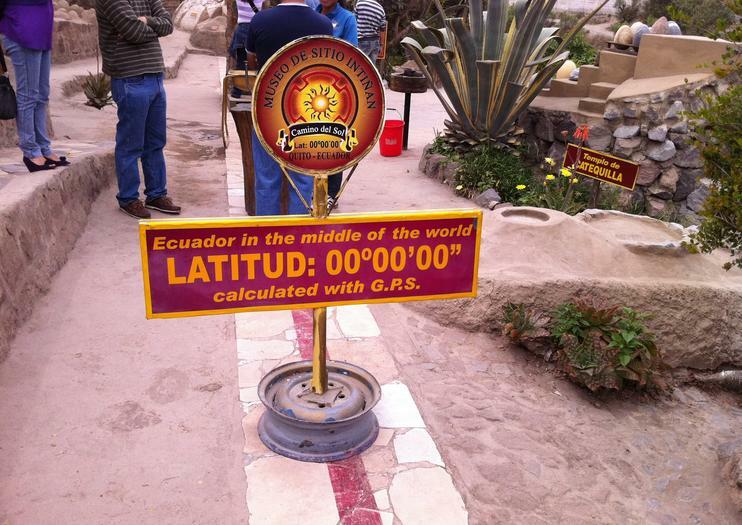 Then, head to the Intiñan Museum to visit the exact division of the northern and southern hemispheres at 00º 00’ 00”. Lastly, head to Quito for a tour of the world’s first UNESCO-listed city and learn about its rich history. Spend the day touring some of Quito's top attractions and experience the thrill of enjoying extreme activities during this full-day option that's perfect for first-time visitors. Straddle two hemispheres at the Middle of the World, volunteer for experiments at Intiñan Museum, then soar over jungle canopies and scenic landscapes on a Tarzan Swing in one of the surrounding valleys. Dive head first into the sights of Quito on a private three day tour. With airport pickup and drop-off, two nights of accommodation, and all transportation included, you don’t need to waste a moment planning logistics. Simply follow your guide and enjoy the comprehensive itinerary, including a tour of the UNESCO listed historical city center. While visiting the highlights, get a photo of yourself straddling the northern and southern hemispheres. Escape the city on this memorable adventure that includes stops at two of Ecuador's incredible volcanoes. Enjoy an exciting 3-hour horseback ride across the Pululahua Crater and head to the Mital del Mundo complex located at the equator. Learn the history of local tribes and how they cultivate the volcanic land. This thrilling outdoor excursion is perfect for first time visitors looking to make the most of their time in Quito. Upgrade your tour an indulge in lunch with panoramic views over the valley and cloud forest. Hotel pickup and drop-off is included. The country of Ecuador takes its name from the line that divides the Earth into two hemispheres. Take a tour of the Middle of the World complex on a private excursion and set foot in both hemispheres. Explore the Museum of Intinan to learn about equatorial science and the indigenous cultures of Ecuador. Finally, stop at Alambi in the Mindo Nambillo Cloud Forest Reserve and admire the various bird species. Enjoy the most complete day trip in Quito, and have a memorable life experience! Discover Quito's top attractions escorted by a knowledgeable certified local tour guide... and enjoy the comfort of a private and safe transportation! This tour will take you to the most amazing places of Ecuador, starting in Quito, Cultural World Heritage, capital of the country, then Galapagos Island Natural World Heritage and it´s unique beauties. Travel to the Middle of the World with a stop at Mitad del Mundo after a personalized tour of Quito. First, a private guide provides insight on the capital city’s historical center, including its World Heritage–listed monuments and churches. After a hike to El Panecillo, a lookout point above the city and home to La Virgen de Quito statue, you’ll stand at the Equatorial monument—0 degrees latitude.